We thank our Almighty Father for your kind support and your prayers. We are still struggling, and we need you now, more than we ever have. Because of you, thousands of incredibly remote families are inspired, kept company, led to healing and motivated to discuss solutions to the many difficulties suffered here. You remain in our daily prayers. Thank you! THE FALL OF MAN: (left) Nome’s winter streets are extremely slippery eight months out of the year, and it’s common to take a tumble now and then. Ordinarily, you brush ice and snow off your clothes and accept a bruise or two. 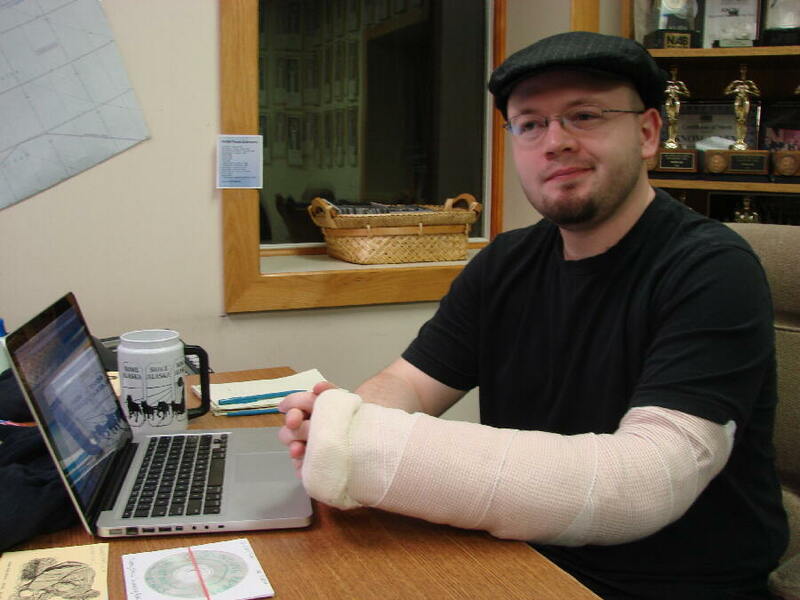 KNOM volunteer news reporter John Francis landed wrong a few paces from the studio building’s front steps and — the doctors aren’t sure — may have slightly broken an arm bone. You’ll be happy to hear that it hasn’t slowed him, and his spirits remain high. Although this picture was taken at 10 AM, you can see that it’s still dark outside. You can imagine how much we’re looking forward to the long days of the arctic summer! “THANK GOD FOR KNOM!” His name is Edward, a Yup’ik Eskimo from Mountain Village on the Yukon River. He and KNOMer Tom Busch happened to meet at a funeral in Anchorage recently and he recognized Tom’s voice. “KNOM saved my life,” he immediately said. Several years ago, using a small boat, he was moose hunting about 200 miles upriver. As the crow flies, he was about 250 miles southwest of Nome. 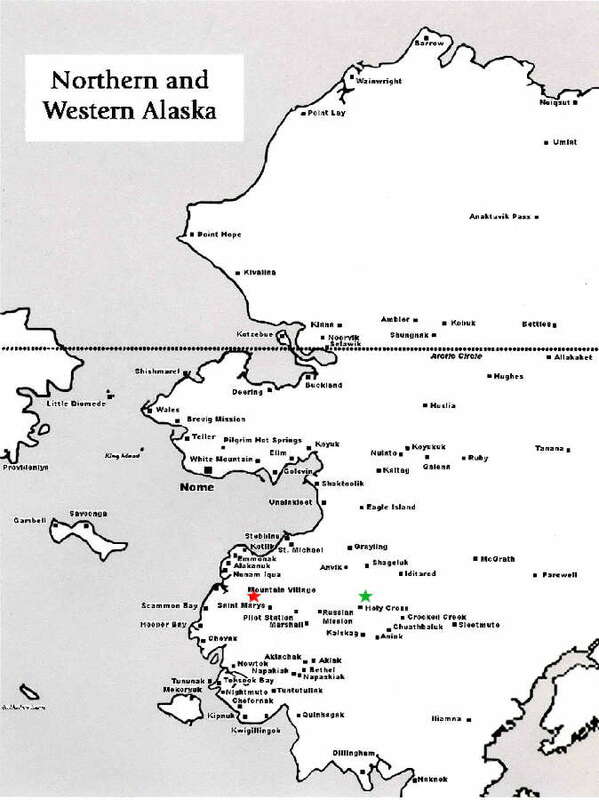 (Left) Edward's home town is shown in red, while the Yukon River spot where he caught KNOM's weather alert is highlighted in green. INSPIRATIONAL SPOT: What does love look like? Saint Augustine said it has the hands to help others. It has feet, to hasten to the poor and needy. It has eyes to see misery and want, and it has the ears to hear the sighs and sorrows of others. SCREENING (left) KNOM volunteer music director Leah Radde is at the controls in Studio A. The left-hand computer screen displays the current lineup of weather, inspirational and educational spots, music and so forth. The right screen can be used to produce all kinds of data. At the moment, it holds a list of songs, which enables Leah to make substitutions so as to time to the top of the hour. 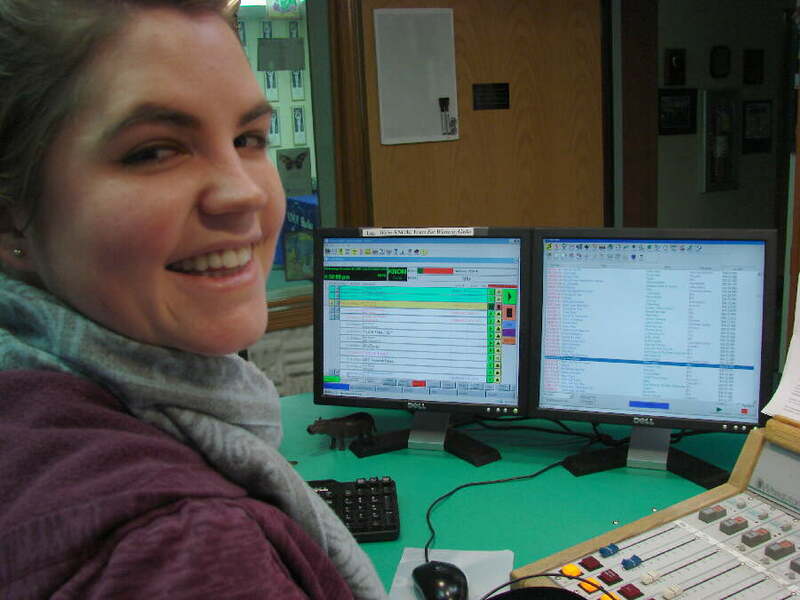 HAIR TODAY…KNOM volunteer inspiration director Danielle Sylvester spends a lot of her off-time volunteering as an Emergency Medical Technician, often on call during overnights for Nome’s volunteer ambulance service. Recently, she donated her hair to be made into a wig for cancer patients. Watch for a photo next month! If that was a time before you joined our mission, you can rejoice that thanks to drastically lowered maintenance and fuel costs, the construction has saved our mission something like $1,100,000. If you were part of that effort, we thank you again, from the bottom of our hearts. And, Anonymous, we especially thank you. You remain in our prayers. INSPIRATIONAL SPOT: Each day of my life I thank my mother for giving me life. I’m grateful that my mother conceived me, carried me and brought me into the world. It’s the greatest gift in the world, life. It’s a gift of God that should always be treated by each of us with great respect. 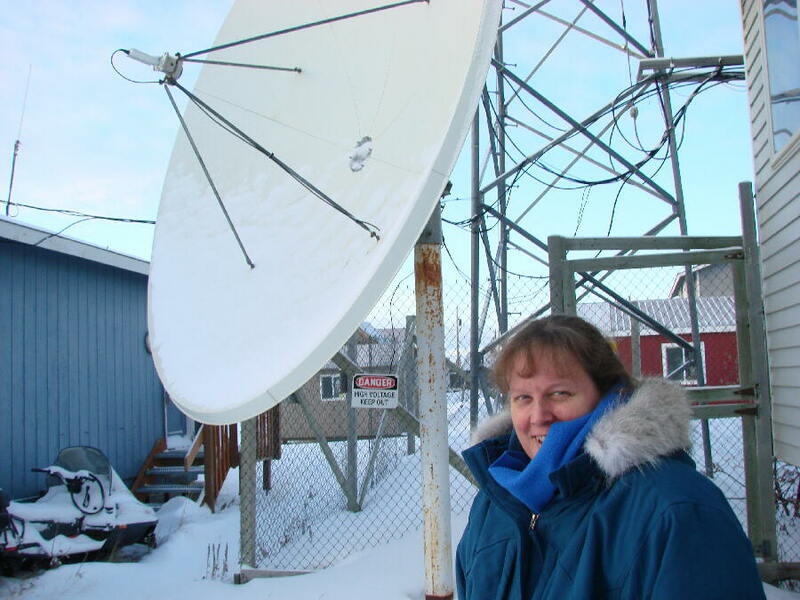 EASY AS ABC: (left) KNOM business manager Lynette Schmidt poses by the satellite dish which provides us hourly newscasts from ABC Radio. Lynette supervises the small upstairs office and keeps the mission’s finances straight. A KNOM volunteer from 1982 to 1985, she returned to Nome with husband Ric, now general manager, in 1995. Three of their children are off to college, and Lynette continues to home school the youngest three, in addition to being extremely active at Nome’s St. Joseph Parish. THE MASS, THE ROSARY, our inspirational spots and other religious programs are core elements of KNOM’s Catholic mission. What are these temporal issues? We could fill this newsletter. Accidental death is 2 times more likely in our region than in urban Alaska. Child abuse is 2.4 times the national average. Poverty in our region is twice the U.S. average and 3 times the Alaska average. 33% of children within reach of our signal do not complete high school, and in the villages of our coverage area, only 2.2% of adults have graduated from college. The good news is that as horrible as these statistics appear, they are far better than they were before KNOM signed on the air in 1971. It would not be accurate for us to take all of the credit for this, but we believe that as a trusted companion for so many people for so many hours each day, our messages of hope, how to live well, how a happy, normal, spiritual life should be, as well as how to seek help, have made a tremendous positive difference. Thank you so very much for making our important work possible. 1992 INSPIRATIONAL SPOT: When you were born, you cried and the world rejoiced. Try to live your life so that when you die, the world will cry and you will rejoice. INSPIRATIONAL SPOT: When I need a word of comfort, He’s there. When I can’t face tomorrow, when my life is filled with pain, He’s there. He’s there when I dread the coming dawn and it seems I can’t go further. When my hopes appear gone, He’s there. He’s always there. He’s there. FORTY YEARS AGO: (left) Tom Karlin is a volunteer with the Diocese of Fairbanks roving construction crew. A master carpenter and cabinetmaker, in March 1970 he ponders a building decision. March 30, 1970, after two trips to Anchorage, volunteer engineer Tom Busch’s final plan to remodel a home into the new Catholic station’s studios is approved by fellow engineers Mel Sather and Jeff Bowden of KTVA-TV. 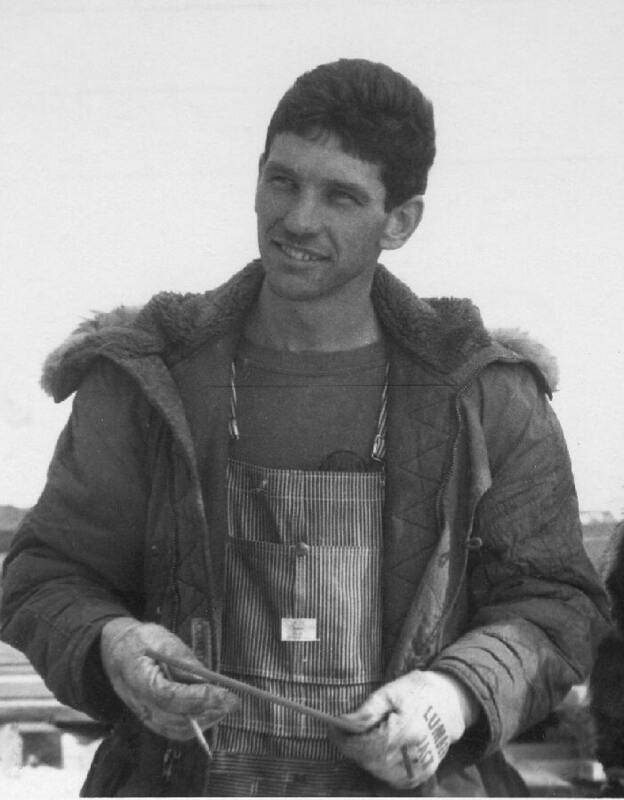 The connection is KTVA owner Augie Hiebert, an Alaska broadcasting pioneer who leads the early battle to establish the Nome station. TWENTY YEARS AGO: When Tom and Florence Busch host a Russian man and his son, they discover that the boy loves popcorn. And so, they send them home with a jar of Orville Redenbacher and some peanut oil. NON-PROFIT THIRD CLASS MAIL has the lowest priority of the U.S. Postal Service. While using it to send you this newsletter saved us over $59,000 over the past year, we have to accept that its delivery is irregular and unpredictable. For many of our friends, due to some bottleneck in the post office, delivery of our December Nome Static was delayed almost a month, while the Year-End Report came immediately. In some cases, that caused the two to arrive on the same day. We hope that you accept that we are doing everything we can to economize in every way. LITTLE THINGS—OR NOT SO LITTLE: Frequently, announcements over KNOM help reconnect people with their pets, their wallets or their key rings. Not long ago, we united a family with their little girl, who had wandered out of the house. It can be a little service—or not so little—and we thank you for making this additional bit of help possible. YOUR PRAYERS, your gifts, your kind thoughts help buoy us during the long Nome winter. While our outside temperatures often remain below zero, and the wind chills far below that, our hearts are warmed by your generosity. May our Almighty Father bless you and those you love abundantly!